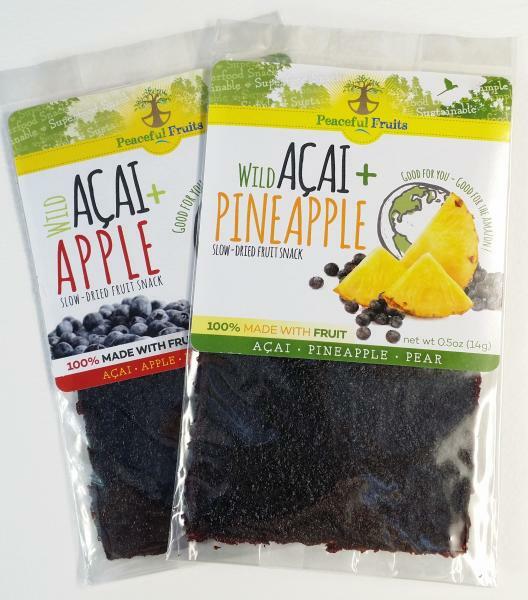 Peaceful Fruits slow-dried fruit snacks come in two flavors, apple and pineapple. 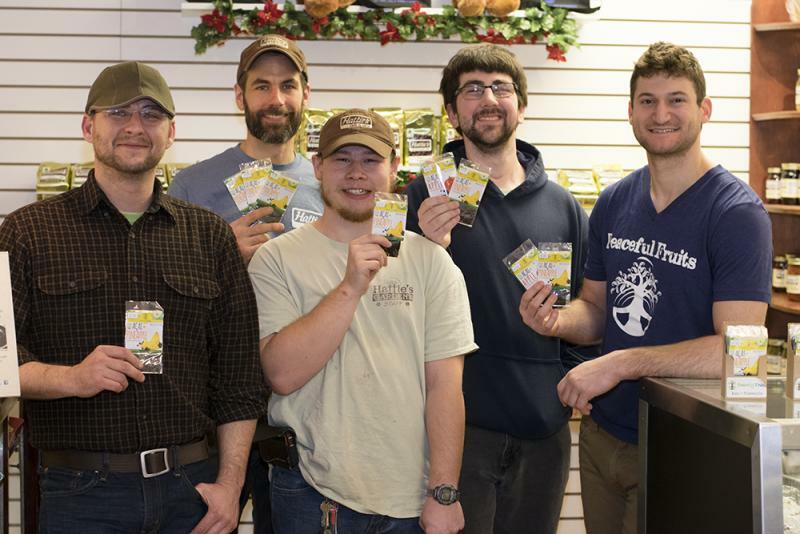 But the main ingredient is acai wild-harvested in the Amazon rainforest and shipped to Akron for processing and packaging by individuals with developmental disabilities at Hattie's Hub in Akron, a local fresh produce exchange. Peace Corps service in a remote South American village has inspired an Akron man to launch a food business. He imports tropical fruit that grows wild in the Amazon rainforest to production facilities in Akron. There, workers with developmental disabilities turn it into fruit leather snacks. WKSU’s Vivian Goodman tells the story of Peaceful Fruits in today’s Quick Bite. Evan Delahanty says making fruit leather with acai pulp from the Amazon combined with fruits grown in the Akron area is a relatively simple process. With what looks like a pizza slicer, he cuts the dried pulp into strips for packaging. His father Michael, a retired Akron doctor, observes. Evan Delahanty is a man on several missions. He wants to employ people with disabilities in meaningful work. He wants everyone to taste acai, the tropical treat he enjoyed in Surinam. And he wants to keep helping the people he worked with there as a Peace Corps community economic development specialist. He arrived in the smallest country in South America in 2011 and spent three months in a training camp in the capital city. Living conditions were primitive. But Delahanty loved the food. Delahanty learned about acai from the villagers he lived and worked with. But the snack Delahanty loved best in Surinam was acai. His first taste was the juice of the berry sweetened with cane sugar. The acai berry grows on tall, slender palms and looks like a small grape. It has fewer antioxidants than grapes but more than oranges, and it’s relatively high in protein, fiber and omega fatty acids. But the FDA says there’s no scientific proof of health benefits and Evan Delahanty makes no health claims. Acai might not be a super-food, but Delahanty saw soon after he started his Peace Corps service that the wild-foraged berries could be the basis of a super business. Delahanty explored the possibilities in his time off from helping villagers make improvements to their infrastructure and economy. He paid attention to his taste buds but listened mostly to his heart. He wanted to keep helping the people of the Amazon rainforest when his Peace Corp mission was over. And he saw that a business based on wild-harvested fruit could provide sustainable economic development that respects the local culture. Delahanty established Peaceful Fruits in 2013, about three months after coming home to Akron. Initially Delahanty made the snacks himself at community kitchens in Cleveland and Akron, but he couldn’t keep up. Reinberger says Delahanty’s Peaceful Fruits is a good fit. Hattie’s Hub employee Katherine Howe seals 3-by-5 inch packages of Delahanty’s fruit leather in biodegradable, certified-compostable bags. “Do you like working with food, Katherine?" As for Peaceful Fruits founder Evan Delahanty, this is his first time working with food. While running the business, he’s keeping his day job. Peaceful Fruits are also now available on Amazon and Akron-area food stores.